German veteran meteorologist Klaus Eckhart Puls writes a piece at the European Institute for Climate and Energy (EIKE) on what he calls the “glaring contradiction between IPCC prognoses and reality”. Rather than increasing 0.2°C per decade, global temperatures over the past decade have actually declined. Since Fritz Vahrenholt’s and Sebastian Lüning’s skeptic book “Die kalte Sonne” has become a German bestseller, major German climate institutes have gone in a state of panic to salvage global warming scenarios. They refuse to acknowledge that observed data deviate completely from their model projections. Instead they have undertaken a massive campaign to feed the media panic machine by unveiling their “latest model projections” which shows the planet is warming rapidly. However, the observed trends tell the opposite story. The Max Plank Institute (MPI) for Climate Research in Hamburg and the Alfred Wegener Institute in Bremen last week went on a professional media blitz, claiming that temperatures are going to climb faster than ever and that the Arctic ice cap will melt – all based on their latest computer models, which will become part of the IPCC 5th Assessment Report. Why do they ignore reality and real observed data and focus on crystal ball projections? The above chart is from data from the Climate Research Unit of the University of East Anglia – a leading provider of climate data to the IPCC. Where’s the warming catastrophe? Answer: in the climate crystal balls of the Max Planck Institute and others only, and nowhere else! 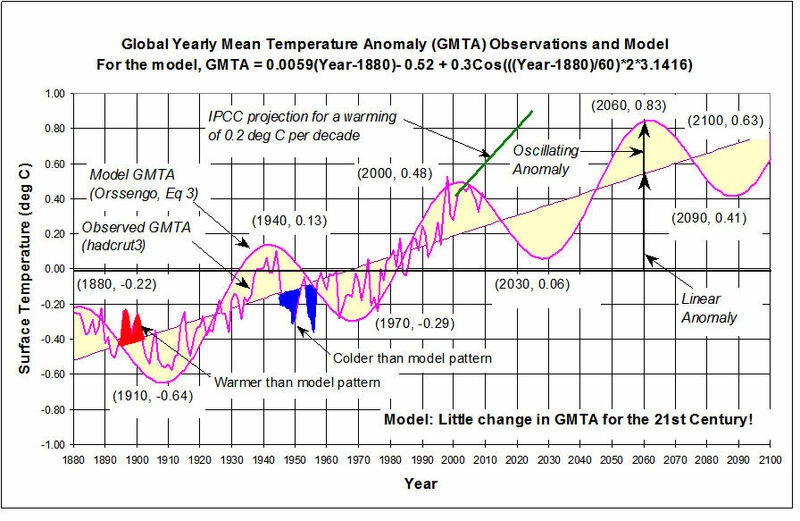 So why do their models continue to produce only warming? It is because the modellers are deliberately ignoring major climate driving factors such as ocean cycles, solar cycles and their amplification mechanisms, and wrongfully transfering their respective warming effects over to human-emitted CO2. Volumes of data and the trends of the last 15 years show this is wrong to do – but they continue to intentionally do it anyway. Deliberately ignoring the major natural factors while wildly exaggerating another, despite the volumes of data out there, has been going on in the IPCC models for years now. We’ve seen the culture of deception in the Hockey Stick, Al Gore’s exaggerated AIT, Climategate, Hansen’s adjustments and just recently with the behavior of Peter Gleick. With every passing year, scientists have noticed the widening deviation between their models and reality, yet they continue to ignore the major factors of sun, oceans and soot, and they manipulate the models even more to make CO2 appear as the culprit. This systematic fudging and manipulation of models is increasingly fitting the definitions of criminal fraud. Unless the IPCC changes its course and starts acknowledging the sun, oceans and soot in its models in its next report, then the public will have grounds to sue them for fraud in a class action suit. The sheer weight of the data showing that the sun, oceans, etc. have considerable impacts is overwelming and can no longer be ignored in good faith. A society the feels defrauded needs to start taking the legal steps to begin moving the case forward. It can be argued that the line between wrong science and fraud science was crossed long ago and that the hand of justice needs to intervene. German readers can read more about Klaus-Eckhart Puls’s piece at EIKE here and “Die kalte Sonne, here“. It occured to me in attempts at debate with William M. Connolley on the “Omitted Variable Fraud” thread on WUWT (he ignored me, BTW) that the modelers have a very simple means of achieving whatever future prediction they want. a) Any model must maintain conservation of energy – in each time step, energy between cells can only be redistributed, not created or destroyed. This is something that goes easily wrong, so they really do test that that holds; an error here would be too blatant. b) Energy comes in from the sun. This is modelled as largely constant; with which I agree. TSI won’t change much. c) Energy leaves only to space. By controlling c) they control the temperature of the model. That’s why they are so relaxed when one tells them, look, you try to model a chaotic system, your simulation MUST go off the rails in no time. They know it can’t happen – they simply control the energy that leaves to space. And how do they do it? Simple. The Aerosol fudge factor. Control the thermalization of photons by aerosols and you have a control knob for the energy content of the model. After decades of research, there are still large uncertainties about the forcing caused by aerosols, and even whether it’s net positive or negative. They have no intention of changing that. If experiments would narrow down the range they would lose this very simple means of tuning the models to whatever warming they like. There is to my knowledge no research other than more modeling going on with regards to the aerosol forcing. That modeling will of course deliver exactly the right results to justify the model’s behaviour; a scientific shell game, a tautology; an obfuscation for the public. I am certain that no form of arguing with the warmist religion will ever convince them otherwise. Let them end up as martyrs in jail after litigation has shown them up for the fraudsters they are. The law is the last resort, so be it. Well, there is an Ice cap in the Arctic : in Greenland. This is probably the idea behind “the Arctic ice cap”, although it is not the proper term. I think that most people understand that. Fair enough comment, and I agree. However, there isn’t “a lot of tundra” under the Greenland ice and it hasn’t been the focus of all those claiming “an ice free Arctic” in the not too distant future. It has been the floating ice that Al Gore made famous with comments and photos of “doomed” polar bears. I think it is a good strategy to always distinguish between frozen ocean and land-ice. There is an interesting post on Paul Hudson’s blog . As regards 2011 as a whole, according to the Met Office, 2011 was the 12th warmest year in their 150 years of global temperature records with an anomaly of 0.346C. This compares to their 2011 forecast of 0.44C. Although this discrepancy is within the stated margin of error, it is the 11th year out of the last 12 when the Met Office global temperature forecast has been too warm. Girma’s model looks much like what the FAO has here, look at page 50. Their model is based on LOD (Length Of Day); the temperature anomaly in the upper graph is detrended. that cycle 24 would be much lower, with 25 leading into the minimum. minimum and that by 2030 we would be in the depth of a new Little Ice Age. It must be noted that Girma as well as the FAO have the ~60 year cycle right but have not taken into account the possible grand minimum Landscheidt talks about, and which seems to materialize – already driving the first warmist extremists mad. I’m regularly looking at WUWT’s temperature and solar reference pages. Yeah, we’re approaching the solar maximum and there’s barely a spot. Soon they will all disappear according to Penn and Livingston. One of the things that those who feel that the sun is the prime surface climate forcer through the oceans rather than CO2 is to better explain solar/ocean/ atmosphere mechanism. There appears to be a lag time between the solar event and the rise in global atmospheric temperatures. This time varies but active solar events [typically 3-5 years long] around a solar maximum from one solar cycle may not always be felt in the atmosphere until sometime during the following solar cycle. There is no better example to illustrate this point than the biggest El Nino on record, namely the one 1n 1878. The starting point was the solar cycle # 11 which ran from 1867- 1878 and peaked at sunspot number of 139. The most active period was from 1869-to 1873 with the max in 1870. Approximately 9 years later in 1878 you have one of the biggest atmosphere temperature spikes in modern history. The Southern Hemisphere SST temperature anomaly [hadSST2] in 1876 was -0.471C and by 1878 it was around -0.148 C and by 1887 it was down to -0.461C. [see graph below] The Northern Hemisphere SST also started to rise in1877 and peaked at+ 0.084 C that year The Southern Hemisphere ocean temperatures started to go up in1874 and also peaked in 1878 and then went down. The global temperature anomaly [hadcrut3gl] was -0.400 C in 1876, peaked at +0.028C in 1878 and went down again to 0.386 C by 1887. What put all that heat first into the oceans and then into the atmosphere? . There is evidence going back to 1860, that the Southern Hemisphere Oceans were already warming through two previous solar cycles # 9 and #10 which were with peak solar spot numbers of 124.7 and 95.8 respectively So in my opinion, the solar cycle #11 put extra energy into the Pacific Ocean between 1869 and 1873 which started to further raise the temperature of the Pacific Ocean around the equator region by 1874 and more aggressively by 1877. The atmosphere temperature peaked by 1878 through the release of the heat from the largest El Nino on record. Direct atmospheric solar heating in 1878 was not cause as that year was a solar minimum year with sunspot number of only 3.4. Lag times make sense. But the last solar cycle was already weaker. We’re in a double dip La Niña and there’s still chances it becomes a triple dip. Maybe already the influence of the last weak cycle. After that it might become worse. The thermocline is at 200m depth. UV rays reach depths of 400m. UV is highly variable during a Solar cycle and energy-rich. The thermocline is stable most of the times. But after a while the solar energy absorbed under the thermocline must cause an instability; upwelling sets in and propagates due to the turbulences and you get a chain reaction until the entire ENSO 3.4 region flips into a different state. The “tipping point” theorists should have looked at that instead of imaginary water vapor feedback, it’s much more interesting and a REAL tipping point. Oh, and I don’t have a link for that but recently it was discovered that UV from the sun goes UP during the falling shoulder of the Solar cycle. Total TSI stays nearly constant but it’s a shift in the distribution of the energy. A similar situation happened with the 1997/1998 El Nino which was the after effect of the 1988-1992 solar maximum activity of cycle #22. The sunspot number in 1997 and 1998 was only 21.5 and 64.3 respectively. So it was not the solar activivty of 1997/1998 that caused the El Nino but a lagged solar event The chain of events noted below leading up the 1997/1998 El Nino illustrates the impact of the previous solar cycle # 22. We can see how the previous solar cycle acting on the Pacific Ocean SST and in a lagged fashion caused a series of El Nino’s with the large 1997 /1998 being the culmination of major heating before. One can follow the South Pacific SST anomalies changes on the graph below from Bob Tisdale’s web page [ see reference below .] Also the Nino 3.4 SST Anomalies graph can be found on Bob’s web page . As there has been no significant solar activity since 2000/2001 and since solar cycle #24, 25 and 26 are predicted to be quite low in terms of sunspot numbers , the next 2-3 decades could be absent of global warming and global cooling is very likely. Spending money to fight global warming is like is like investing in air conditioning units to fight a major snow blizzard. It makes absolutely no sense when we should be preparing for the opposite and secure the necessary energy for the cooler era ahead. I apologize for the inpertenance, but this picture of Madame Merkel is just too funny. How do i get a copy of the book. Also dirkh would you be able to email the information you have found. my father has been looking into it and agrees with wat your saying. What information do you mean, david?